It was a quiet week in the markets and rates were a little lower. It was a quiet week with no major surprises. Mortgage rates ended the week slightly lower. The most significant economic data released this week was the inflation data. The Consumer Price Index (CPI), the most closely watched monthly inflation report, looks at the price change for finished goods and services. Friday's release revealed that inflation has continued to rise in recent months. Core CPI, which excludes the volatile food and energy components, was 2.4% higher in July, up from an annual rate of increase of 2.3% in June. This matched the consensus forecast and was the highest level since September 2008. By contrast, the Producer Price Index (PPI) focuses on the increase in prices of "intermediate" goods used by companies to produce finished products, which investors view as a little less indicative of the level of inflation in the economy as a whole. 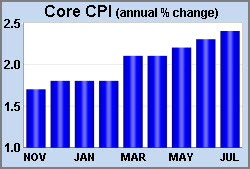 On Thursday, Core PPI was 2.7% higher in July, down from an annual rate of increase of 2.8% in June, and a little lower than expected. Since inflation is negative for bond yields, this report was mildly favorable for mortgage rates. The JOLTS report measures job openings and labor turnover rates. Fed officials and investors value this data to help round out their views of the strength of the labor market. 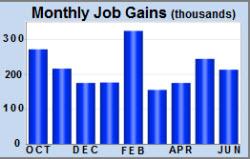 In June, there were 6.66 million job openings, which was close to the record levels seen in April. There were only 6.56 million people who reported that they were looking for work that month. It is rare to see more job openings than people seeking work. A large number of workers also willingly left their jobs. This is viewed as a sign of labor market strength, since people usually quit only if they expect that they can find better jobs. Looking ahead, Retail Sales will be released on Wednesday. Consumer spending accounts for about 70% of all economic activity in the U.S., and the retail sales data is a key indicator of growth. Industrial Production, another important indicator of economic growth, also will come out on Wednesday. Housing Starts will be released on Tuesday. Friday's key Employment report came in pretty much right on target across the board. Against a consensus forecast of 190,000, the economy gained 157,000 jobs in July. 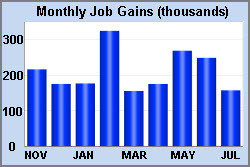 However, upward revisions added 59,000 jobs to the results for prior months. The economy has gained an average of 215,000 jobs per month so far this year, exceeding even the strong pace of 184,000 seen over this period last year. As expected, the Fed made no policy changes at Wednesday's meeting. The Fed's statement was very similar to the prior one from the June meeting. The most notable change in the statement was that Fed officials modestly upgraded their assessment of the pace of economic growth. In particular, the statement said that economic activity "has been rising at a strong rate," while the prior statement described it as "solid." In addition, Fed officials noted that household spending and business investment have "grown strongly." In June, they just said that it had "picked up." Investors expect that the Fed will raise the federal funds for the third time this year at the next meeting on September 26. The main influence on mortgage rates this week was fresh news about tariffs, which was negative for mortgage rates. The major economic data came in mostly on target, and Thursday's European Central Bank meeting contained no policy changes and had just a minor impact. As a result, mortgage rates ended a little higher. On Thursday, the Trump administration announced that the U.S. and the European Union (EU) had agreed not to escalate their trade dispute. Neither will impose further tariffs while the two sides attempt to work out their differences. If the U.S. and the EU can come to terms, it would allow them to work together to focus on improved trade agreements with other countries, most notably China. Investors reacted to the reduced chances of a trade war by shifting to riskier assets such as stocks from safer assets such as bonds, including mortgage-backed securities (MBS). The decrease in demand for MBS caused mortgage rates to rise a little. 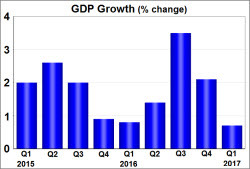 Friday's release of second quarter gross domestic product (GDP), the broadest measure of economic growth, showed a massive increase of 4.1%, which was close to the expected levels. This was up from 2.2% during the first quarter and was the highest reading since the third quarter of 2014. Strength was seen in both consumer spending and business investment. Investors now will be watching to see if the underlying trend is closer to the first quarter or the second quarter levels. Looking ahead, the important monthly Employment report will be released on Friday. As usual, these figures on the number of jobs, the unemployment rate, and wage inflation will be the most highly anticipated economic data of the month. Before that, the Core PCE price index, the inflation indicator favored by the Fed, will be released on Tuesday. The ISM national manufacturing index will come out on Wednesday, and the ISM national services index will come out on Friday. The next Fed meeting will take place on Wednesday. No change in policy is expected. It was a relatively quiet week for mortgage rates. The major economic data was mixed, and mortgage rates ended a bit higher. Consumer spending accounts for about 70% of economic activity in the U.S., and the retail sales data is a key indicator of growth. Retail Sales unexpectedly turned negative for three months during the winter, causing investors to question the strength of the economy. Since then, however, sales have been very strong. 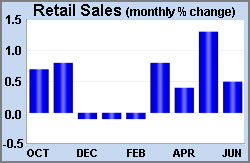 Monday's data showed a solid increase in June of 0.5% from May, and the May results were revised much higher to 1.3% from 0.8%, which was the largest monthly gain since September 2017. Given the strong retail sales data, along with other major reports, the Atlanta Fed's forecast for second quarter gross domestic product (GDP) is up to a whopping 4.5%, more than double the 2.0% growth seen in the first quarter. The news from the housing sector was less encouraging. In June, housing starts fell 12% from May to the lowest level since September 2017.  The decline was split roughly evenly between single-family and multi-family units. Single-family starts reached a 10-year high in November 2017, but they have fallen steadily since then. Despite a huge need for more inventory of homes in many regions, higher labor, land, and material costs are some of the reasons cited by homebuilders for the slowdown in new construction. 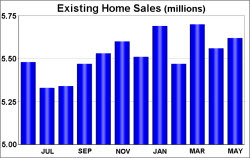 Looking ahead, Existing Home Sales will be released on Monday and New Home Sales on Wednesday. Durable Orders, an important indicator of economic activity, will come out on Thursday. The first reading for second quarter gross domestic product (GDP), the broadest measure of economic growth, will be released on Friday. In addition, a European Central Bank meeting on Thursday could influence U.S. mortgage rates. The main influence on mortgage rates this week was Friday's Employment report which was viewed on balance as a little weaker than expected. The Fed minutes and the other data had just a minor impact. As a result, mortgage rates ended lower. Against a consensus forecast of 190,000, the economy gained 213,000 jobs in June. In addition, upward revisions added 37,000 jobs to the results for prior months. The economy has gained an average of 215,000 jobs per month so far this year, exceeding even the strong pace of 182,000 seen over this period last year. The unemployment rate increased from an 18-year low of 3.8% to 4.0%, above the consensus for a flat reading of 3.8%. There are two factors which influence the unemployment rate, and June's increase was due to a surge of workers entering the labor force rather than job losses, so this actually was viewed as a sign of strength. Average hourly earnings, an indicator of wage growth, fell slightly short of expectations. They were 2.7% higher than a year ago, the same annual rate of increase as last month. Overall, the shortfall in wage growth was viewed by investors as more significant than the strong job gains, and mortgage rates moved a little lower after the data. The minutes from the June 13 Fed meeting released on Thursday contained no major surprises and caused little reaction for mortgage rates. Noteworthy, though, Fed officials discussed both upside and downside risks to the economy. They pointed to the recent tax cuts as a potential source of support for economic growth in coming years, but also the risk that increased trade tensions could slow future investment activity, which would be negative for the economy. Looking ahead, the inflation data will get the most attention. The Producer Price Index (PPI) focuses on the increase in prices of "intermediate" goods used by companies to produce finished products and will come out on Wednesday. The Consumer Price Index (CPI), the most closely watched monthly inflation report, will come out on Thursday. CPI looks at the price change for finished goods and services. In addition, Treasury auctions on Wednesday and Thursday could influence mortgage rates. Over the past week, comments from Fed officials and weaker than expected economic data were positive for mortgage rates. After rising for the last two weeks, mortgage rates ended this week lower. Every six months, the head of the U.S. Fed testifies before Congress. In her testimony on Wednesday, nearly all of Fed Chair Janet Yellen's comments simply reiterated what had already been communicated by Fed officials. However, she did provide one new piece of information regarding future Fed policy which caused a significant reaction. Yellen said that the Fed would not have to raise the federal funds rate "all that much further" to reach a "neutral policy stance," which is the rate which neither helps nor hinders economic growth. The practical implication of a lower "neutral" rate is that the Fed would stop raising rates sooner than investors had previously expected. A potentially smaller number of future rate hikes was viewed as good news for mortgage rates. A shortfall in the retail sales and inflation data released on Friday also was positive for mortgage rates. 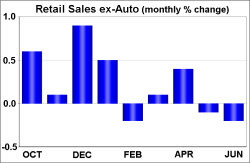 Excluding the volatile auto component, retail sales in June declined for the second straight month, while the consensus was for a modest increase. This was the first period of back-to-back monthly declines since July and August of last year. The inflation data also fell short of expectations. The core consumer price index (CPI), which excludes food and energy, remained well below the Fed's target level of 2.0%. Expectations for another rate hike by the Fed this year declined after the release of the retail sales and inflation data. Looking ahead, the biggest event for U.S. markets next week likely will be the European Central Bank meeting on Thursday. While ECB officials have already said that they will wait for the meeting on September 7 to announce their plans for the bond purchase program, any guidance at this meeting about future policy will affect markets around the world. It will be a light week for U.S. economic data. The NAHB housing sentiment index will be released on Tuesday. Housing Starts will come out on Wednesday. The Philadelphia Fed regional manufacturing index will be released on Friday. Comments from Fed officials caused some volatility this week but had little net effect. The economic data caused little reaction. Mortgage rates ended the week nearly unchanged, close to the best levels of the year. Last week's weak inflation data had Fed officials talking this week. To the surprise of many, inflation has declined during each of the last few months. Fed officials seem divided on how to react. Some consider the recent decline transitory and want to continue monetary tightening. Others question this and want to slow things down. On Monday, New York Fed President Dudley said that he thinks rising wages will push inflation higher and that to slow the current pace of monetary tightening could do harm to the economy. On Tuesday, Chicago Fed President Evans said that the Fed "can afford" to wait "a little bit" to see if inflation moves higher. The debate caused some market volatility. The existing-home sales data from the National Association of Realtors released on Wednesday revealed that a shortage of inventory continued to be an issue in May. Total inventory of existing homes available for sale was significantly lower than a year ago and was at just a 4.2-month supply. A 6-month supply is considered a nice balance between buyers and sellers. The low supply of inventory and robust buyer demand caused prices to rise and properties to be sold very quickly. The median existing-home price reached a record high in May, and it took just 27 days on average for properties to be sold. This was the shortest duration since tracking began in 2011. 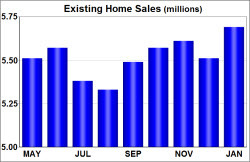 Even with a low level of inventory in many markets, existing-home sales in May rose a little from April to the third highest level over the past twelve months. Sales of new homes, which make up roughly 10% of the market, also climbed in May, and the median price of new homes rose to a record high as well. Looking ahead, Durable Orders, an important indicator of economic activity, will come out on Monday. Pending Home Sales will be released on Wednesday. The Core PCE price index, the inflation indicator favored by the Fed, will come out on Friday. In addition, there will be Treasury auctions on Monday, Tuesday, and Wednesday. Mortgage Rates ended the week a little higher due to influences from Europe. Over the past week, mortgage rates were influenced mainly by events in Europe. The outcome of Sunday's French election was bad for mortgage rates, while Thursday's European Central Bank meeting was mildly positive. The U.S. economic data had little impact. Mortgage rates ended the week a little higher. One pro-EU candidate (Macron) and one anti-EU candidate (Le Pen) won the first round of Sunday's French Presidential election and will compete in the second round on May 7. Polls indicate that Macron is heavily favored to win the second round, which reduces some concerns that France will leave the European Union. Investors reacted by reversing the flight to safety trade which took place ahead of the election. This means that they shifted back to riskier assets such as stocks and out of safer assets such as mortgage-backed securities (MBS). The increased supply of MBS caused mortgage rates to rise. At Thursday's meeting, the European Central Bank (ECB) made no policy changes, as widely expected. The tone of ECB President Draghi was more dovish than anticipated, however. Some investors had worried that ECB officials might hint at a reduction in bond purchases by the ECB. The fact that they did not was good news for mortgage rates. 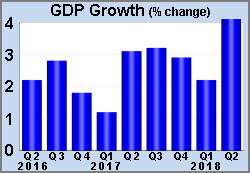 The first reading for first quarter U.S. gross domestic product (GDP) released on Friday was 0.7%, below the consensus of 1.1%, and down from 2.1% in the fourth quarter of 2016. This was the slowest quarterly growth in three years. Weak consumer spending and a decline in inventories were a couple of the primary factors in the shortfall. These components are volatile on a quarterly basis, and many economists believe that the weakness in the first quarter simply pushed some economic activity into later quarters. As a result, the report had little impact on mortgage rates. Looking ahead, it will be a packed week. The next Fed meeting will take place on Wednesday. No change in rates is expected, but investors will be eager for guidance on the pace of future tightening. The key monthly Employment report will be released on Friday. Before that, important data on inflation, manufacturing, and services will be released. In addition, news about policies from the Trump administration or about the French election on May 7 could influence mortgage rates. Mortgage rates ended the week higher due to stronger economic data and expectations the Fed will raise rates soon. This week, speeches by several Fed officials were more hawkish than expected. This caused investors to expect a faster pace of monetary policy tightening. Futures markets now price in about a 75% chance of a federal funds rate hike at the next Fed meeting on March 15, up from just a 25% chance a week ago. While the federal funds rate is more highly correlated with short-term yields than with long-term yields such as mortgage rates, a faster pace of tightening is bad for mortgage rates because it likely means that the Fed will begin to reduce its holdings of mortgage-backed securities (MBS) sooner. Fed purchases of MBS have helped mortgage rates move lower in recent years, so the shortened expected timeline for reduced demand from the Fed caused mortgage rates to rise. One reason that Fed officials may be inclined to hike rates this month is that recently released economic data has generally continued to surpass expectations. Since the election, both consumers and businesses appear to be more optimistic about the economic outlook. 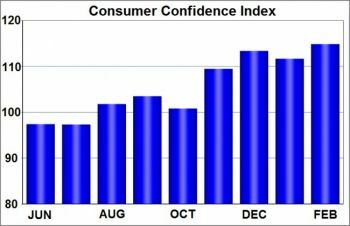 The February measure of Consumer Confidence from the Conference Board rose to the highest level since 2001. The ISM national manufacturing index increased to 57.7, the highest level since August 2014. Readings above 50 indicate an expansion in the sector. As recently as August, the index was below 50. The ISM national services index also rose more than expected to 57.6, the best reading since April 2015. Stronger economic activity raises future inflationary pressure, which is bad for mortgage rates. Looking ahead, there will be a European Central Bank (ECB) meeting on Thursday. No policy changes are expected, but guidance about the outlook for future policy could influence U.S. markets. In the U.S., the important monthly Employment report will be released on Friday. As usual, this report on the number of jobs, the unemployment rate, and wage inflation will be the most highly anticipated economic data of the month. In addition, there will be Treasury auctions on Tuesday, Wednesday, and Thursday. Mortgage rates ended the week lower again. One source of volatility is uncertainty about the outcome of upcoming elections in several European countries. Investors are most focused on the presidential election in France which will take place on April 23. Polls show a close race between Marine Le Pen and Emmanuel Macron. Le Pen's campaign has been centered on plans for France to leave the EU and to stop using the euro currency, while the centrist Macron has run on a more traditional platform. It is not clear what would happen to the EU if France decided to exit. As a result, investors have reacted by shifting to safer assets after news which favors a Le Pen victory and doing the opposite after positive news for Macron. Since U.S. mortgage-backed securities (MBS) are viewed as relatively safer assets, they have been affected by the shifts in sentiment, causing volatility. The net effect on mortgage rates for the week was positive. The Fed was another source of volatility this week. On Wednesday, the Fed released the minutes from the February 1 Fed meeting. Concerned that the Fed might talk about a need to reduce its holdings of MBS, investors pushed mortgage rates a little higher ahead of the release of the minutes. When the minutes made little mention of this topic, investors later reversed their positions, resulting in little net change. Looking ahead, Pending Home Sales and Durable Orders will come out on Monday. The Core PCE price index, the inflation indicator favored by the Fed, will be released on Wednesday. The ISM national manufacturing index also will come out on Wednesday, and the ISM national services index will be released on Friday. Fed Chair Yellen is scheduled to speak on Friday as well. The next Employment report will come out on March 10 (due to February being a shorter month). How hot is the Boston real estate market?